The Drive from Zion to the town of Escalante is pretty spectacular. Our base camp here is the Shooting Star V Resort/Drive-in/Airstream Motel. 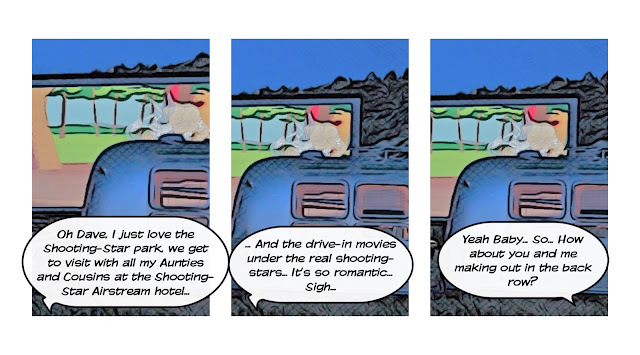 We read about this place during the incubation period of our nomad lifestyle and now after almost four years the stars have finally hit the bulls eye. The original developer dreamed of an Airstream only RV Park with an Airstream Motel renting vintage trailers decorated as luxury movie star on-set trailers and a drive-in movie theatre screening classic films nightly with classic car seating. He built it but they didn’t come. In 2014 the park was sold to the current owners. Our host Troy is super friendly and has lots of information about the area. With only word of mouth advertising, the Airstream Motel is fully booked the ten days we’re here. In fact they just purchased another vintage trailer and plan to add an Elvis Airstream to the collection. Movie night is now only Tuesdays, Thursdays and Saturdays. You can rent a classic car to sit in or just bring a lawn chair. Of course the snack bar is in a renovated Airstream. The movie is free and snacks are really reasonable. 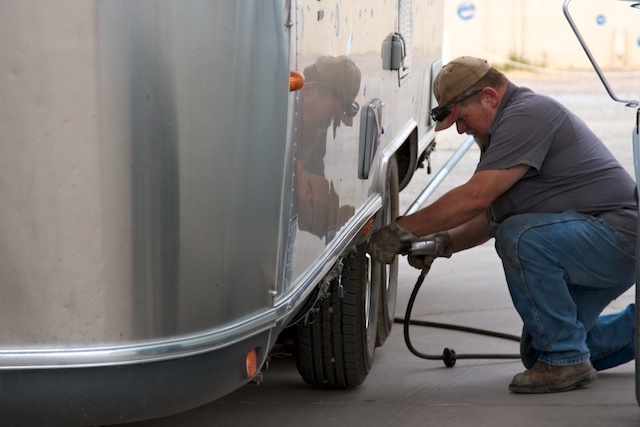 The Airstream only RV Park didn’t work out, so it is open to all classes of trailers, RVs and tent camping. 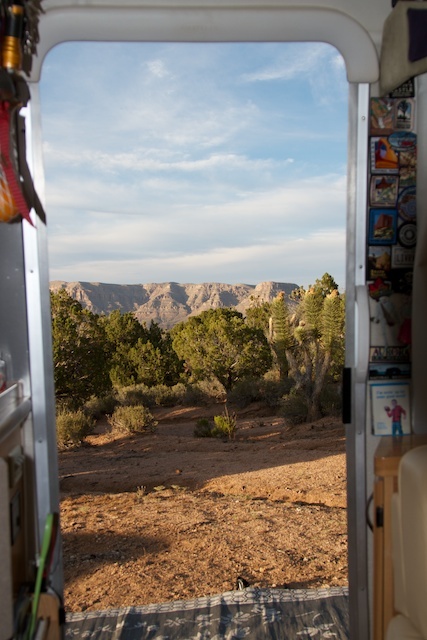 We get a spot nestled between two movie star Airstreams with stunning views. It’s a great quiet location outside of town. 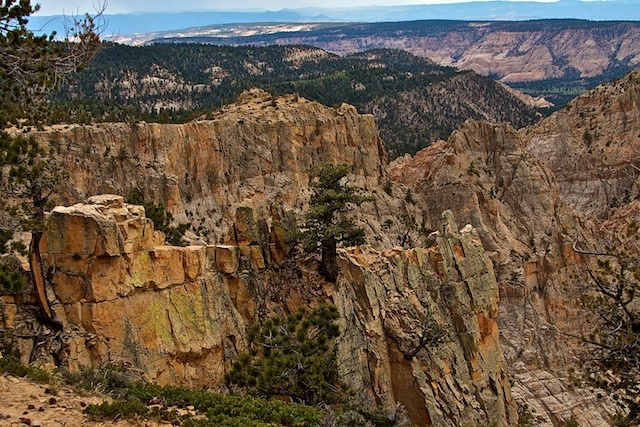 Just down the road toward the town of Escalante, is the Escalante Interagency Visitor Center. Here we get maps and check road conditions. 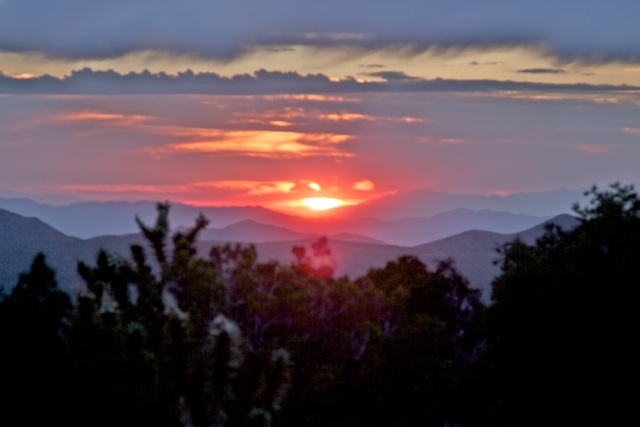 The BLM Ranger is pretty clear that when we venture out onto the unpaved roads of the region, we are on our own, self-rescue is expected, and we need to travel prepared and with plenty of water. He won’t tell us where to go, but he’ll gladly answer any questions and give us a map or handout if we ask for it… OK… this is our first time here…. 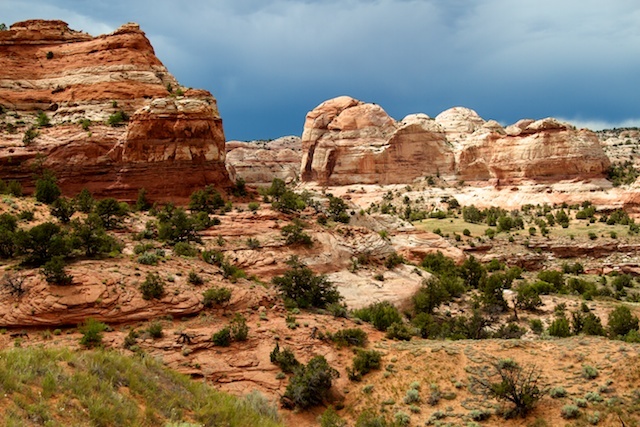 And… Grand Staircase-Escalante National Monument (GSENM) spans nearly 2 million acres… and… it was the last place in the continental United States to be mapped… “Umm… How about hiking trails?” With a big smile he hands us a map and list of eleven hikes and two scenic drives. A beginner’s guide to the GSENM Perfect! 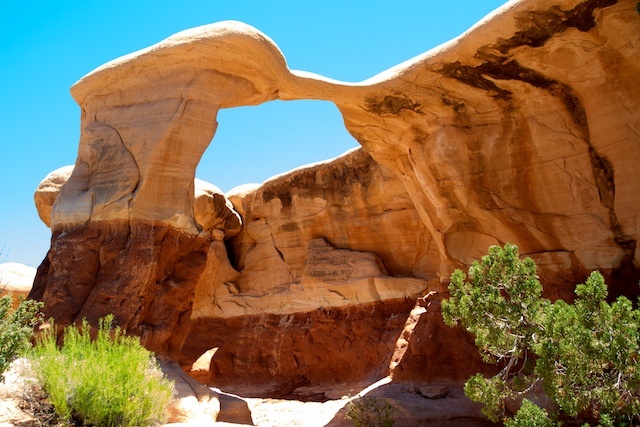 We also stop at the Hole in The Rock Escalante HeritageCenter and learn about the Mormon pioneer project to forge a short cut through Escalante to the isolated San Juan region in southeastern Utah. 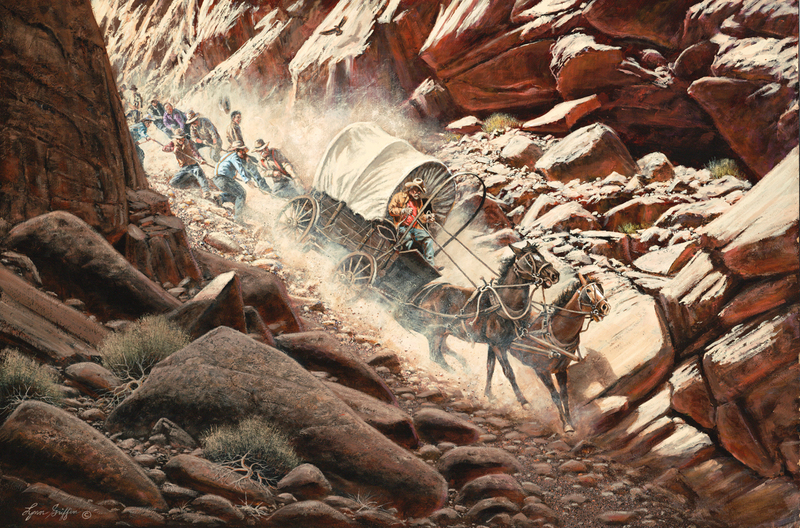 236 folks dragged all of their personal belongings in wagons across the mesa and camped in the desert for six weeks. The men blasted a notch in the cliff a few miles away and built a trail a mile long with a 25 to 45 percent grade, down to the Colorado River. One of the pioneers described the area: “It’s nothing in the world, but rocks and holes and hills and hollows.” The same description applies today. 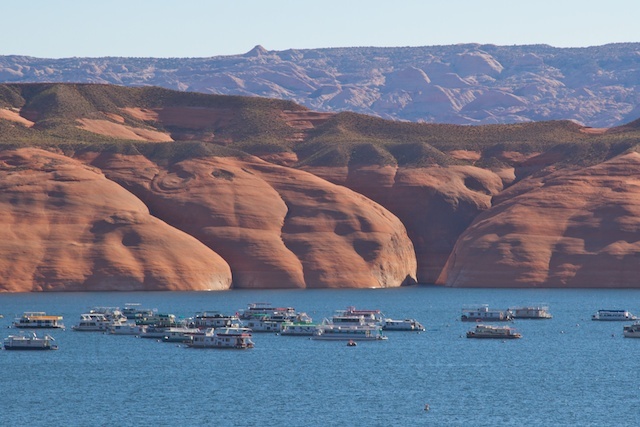 The hole and the steep trail are still there, accessible from the top at the end of Hole in the Rock Road, (55 miles of unpaved 2wd high clearance road – last 5 miles 4wd) or from below by boat from Lake Powell. There is so much to see and do along the 55 mile, unpaved 2wd high clearance (last 5 miles 4wd) Holein the Rock Road that we have to make multiple trips to see only a fraction of the attractions. Our first foray takes us 26 miles out to a turnoff onto a narrow, muddy, with deep ruts and high banks, dirt road that gets us to the Dry Fork Narrows Trailhead. A family in a Range Rover and a group in a small Honda follow us in. After we all park, the woman from the Rover looks at us, then to the Honda, points to her car and says, “Why did I pay $90k for this?” We all laugh and head to the trail. It’s all down hill to the Dry Fork Drainage. It rained the day before and the canyons are wet and muddy. We hike up Dry Fork Gulch until the mud threatens to pull our boots off. 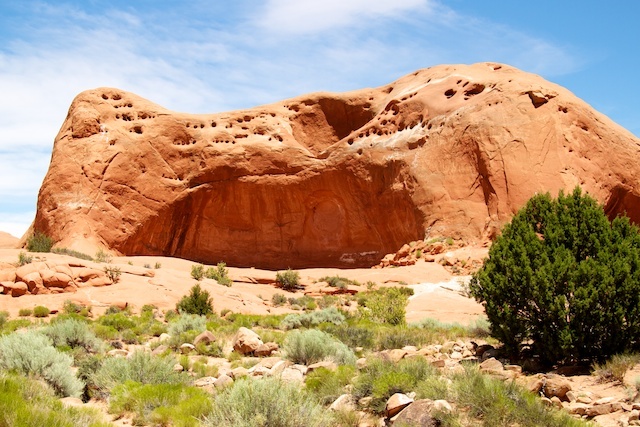 We hear that Peek-a Boo Gulch has a forty-foot mud pit, which doesn’t sound too appealing. On the hike back up to the trailhead we decide to see how far we can get out Hole in the Rock Road. The scenery is stunning and the going is slow. (Lots of rocks, ruts, mud, washboard, and washes and of course stops to take photos.) At the Dance Hall Rock, we get out and explore the area. We get five miles from the end of the road, this part is 4wd and the going is slow. We estimate at least another 45min to an hour to get to the hole in the rock, which will add 1.5-2 hrs. to this trip. It’s getting late and the sun will definitely set before we get back to camp. We reluctantly turn around. The sun is going down when we get back into town. We stop at The Escalante Outfitters for Pizza and Brews. A couple of Polygamy Porters each (You can’t have just one,) a farmer’s Market Veggie Salad, (spinach, red onion, goat cheese, and slow roasted tomatoes with house raspberry vinaigrette) and a tasty King’s Mesa Pizza, (grilled chicken, ham, peperoni, smoked apple wood bacon & local Italian sausage) finish off our long day of driving and hiking. Another day and its 13 miles out Hole in the Rock Road is the Devil’s Garden. This is a great area for hiking around hoodoos and under arches. Just past The Devil’s Garden we turn off on Collet Top Road and go 2.6 miles. Destination: the Twenty-mile Wash Dinosaur Mega-trackway. We hike around the area and check out the slick rock. 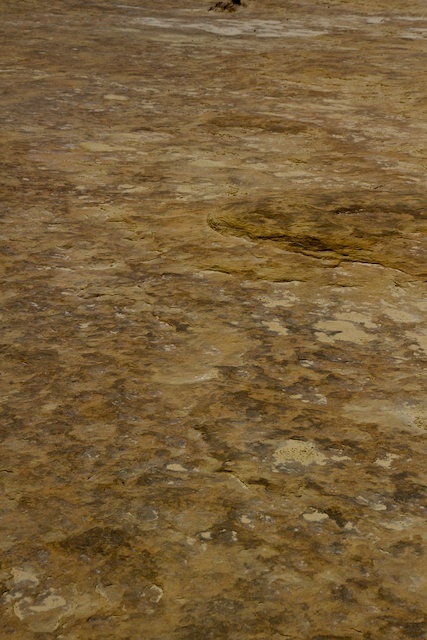 There are over 800 dino footprints, so many overlapping that the individual prints are hard to distinguish. However, Hole in the Rock Road is just one of many scenic drives. Actually, just about every road, paved and unpaved, in this area is a scenic byway. 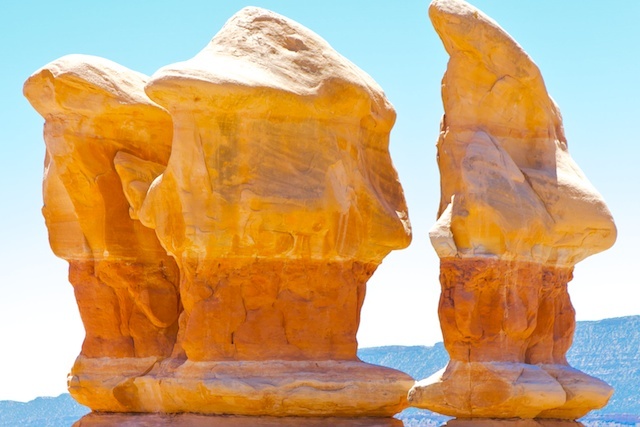 The All American Highway 12 runs from Bryce Canyon to Capitol Reef National Park. Some of the most spectacular views are between the towns of Escalante and Boulder, especially over the narrow Hogback, where both sides of the road have steep drop-offs. A little gem along this road is the Kiva Koffee House. Away from everything this is a great place to stop for breakfast or lunch, or an espresso or mocha chai and amazing views. Trailheads off Hwy 12 lead to some amazing sites. 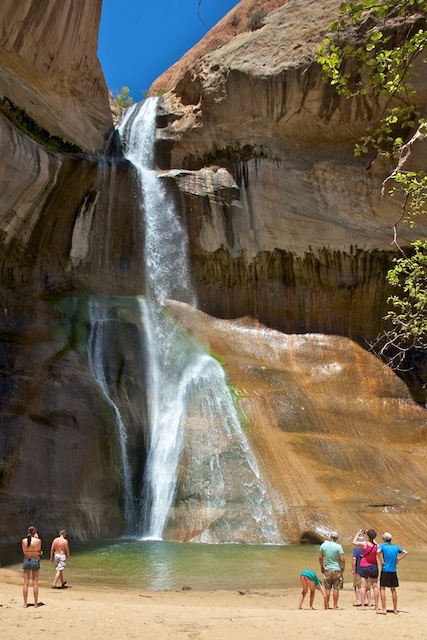 Best experience: Removing our boots and soaking our feet at the base of Lower Calf Creek Falls after a 1.5 mile uphill trek in 95 degree weather is heaven. A picnic lunch and a nap on the beach and then the downhill trek back to the parking lot. Hell’s Backbone Road is another unpaved byway. It runs from Highway 12 in the town of Escalante up Boulder Mountain (9,000 ft) and back to Hwy 12 in Boulder. Mid-point is the turnoff to Posey Lake. At 8,800 ft this is a great place to beat the heat. The road also passes through Box-Death Hollow where the Hell’s Backbone Bridge spans 109 feet over a 1,500-foot drop on both sides of the narrow one lane bridge. The 38 mile road is narrow, winding and not for the faint of heart or those with acrophobia. 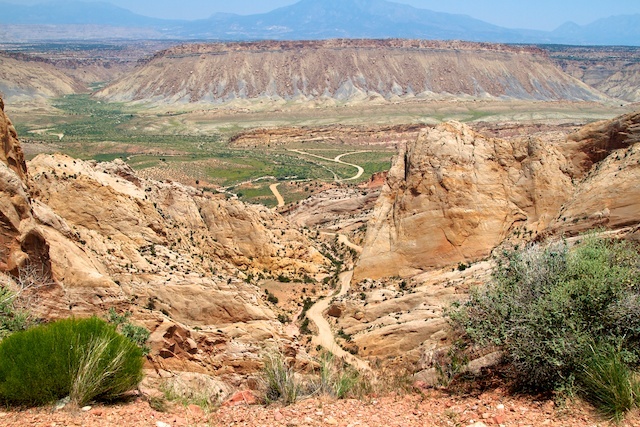 The Burr Trail connects the town of Boulder with the Capitol Reef National Park. 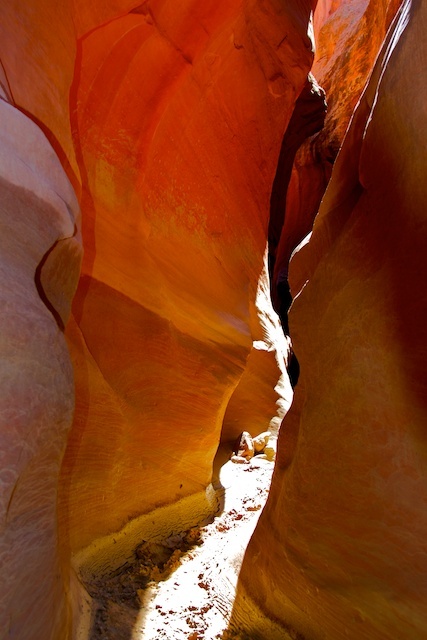 Along the way: sandstone sand dunes, towering red cliffs, golden narrow canyons, a slot canyon, arches, washes, and creek crossings. The road is paved for the first 31 miles until we reach the national park where it becomes gravel, after about 4 miles we reach the top of the mile of switchbacks that descend into the Waterpocket Fold. 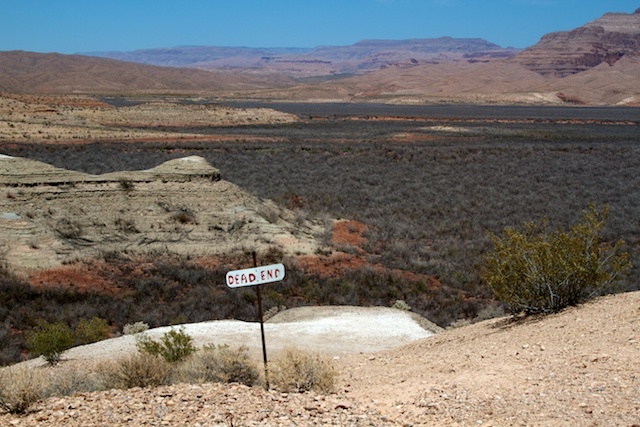 At the bottom of the switchback, the Road tees south toward the town of Bullfrog on Lake Powell, north heads up to the Capitol Reef National Park. We venture in both directions over a couple of days. 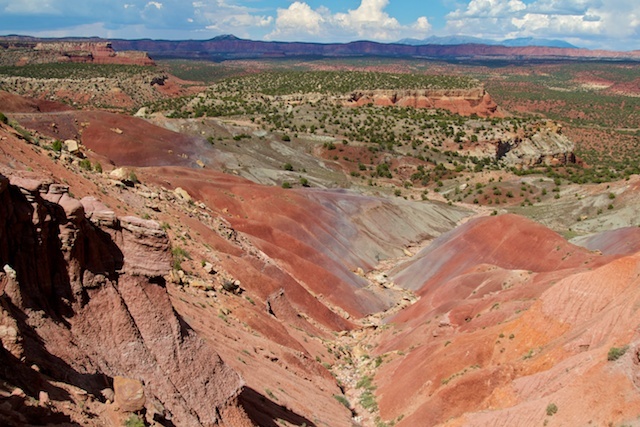 Lots of hiking trails and stunning scenery point us to our next destination: Capitol Reef National Park. It’s the start of summer vacations. 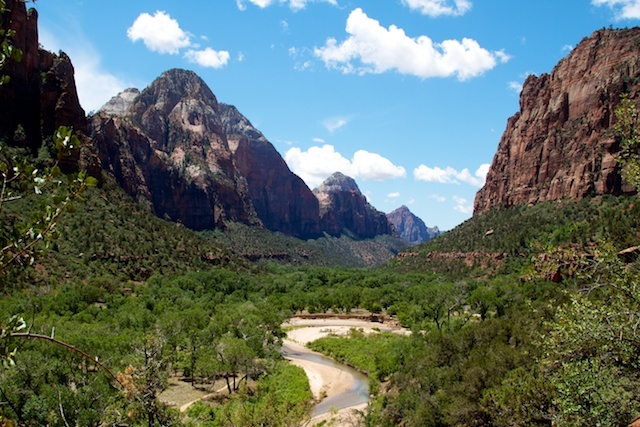 The campgrounds in Zion National Park are full. 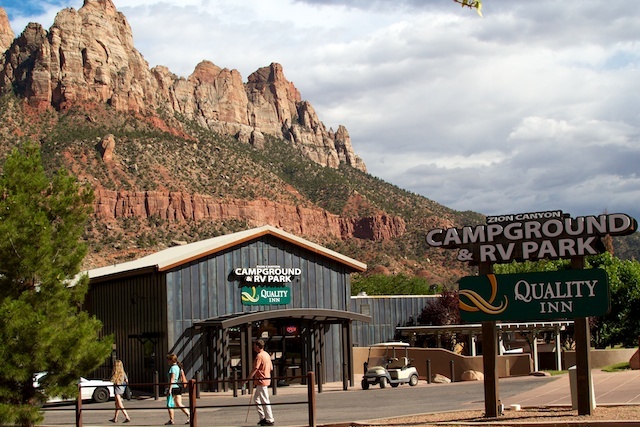 We are fortunate to get a spot for a few days at the Zion Canyon Campground just outside the park. The spaces here are tight and we’re backed up to the tent sites. It’s crowded, noisy and populated with pyrotechnically challenged campers who build smoldering campfires that produce billowing clouds of heavy black smoke each evening. 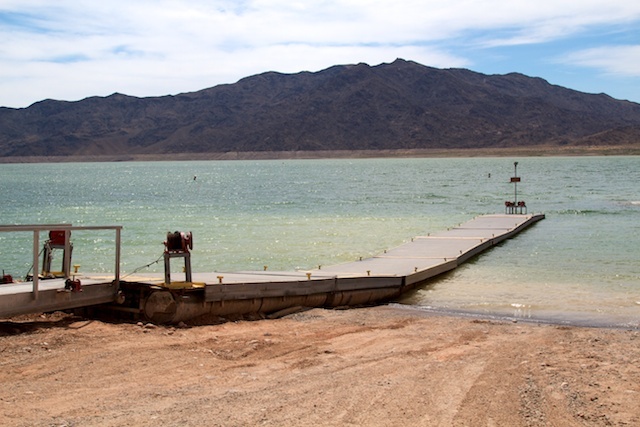 On the plus side: It situated along the Virgin River and is within walking distance to the park visitor center. 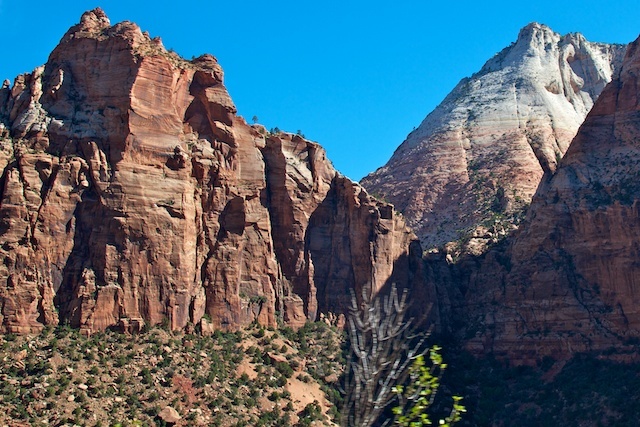 There are basically three roads in the park: The Scenic Drive, Kolob Terrace Road and the Zion-Mt. Carmel Highway. 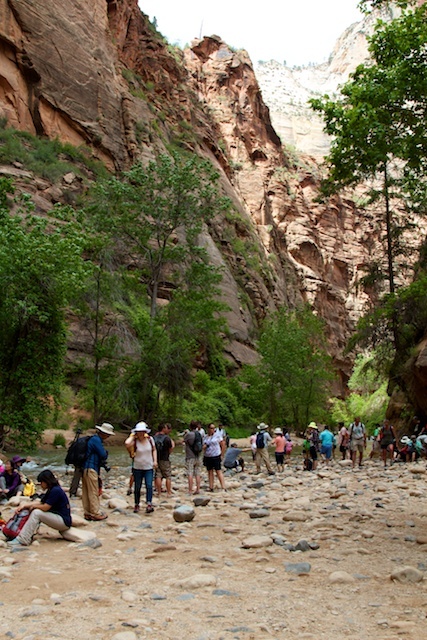 Private vehicles are banned from the Scenic Drive but the park provides a free bus service to shuttle visitors up and back through Zion Canyon. Every Shuttle is packed and we get off at each stop to view the geologic icons and do a little hiking. The trails are terribly crowded, it’s human bumper cars; folks looking up crash into bodies stopping to admire or photograph the stunning scenery. After one day spent in the canyon we decide to concentrate on the more remote sections of the park. This summer Kolob Terrace is closed from 8:00AM to Noon and 1:00PM to 4:30 for roadwork. Since we like to sleep in, we get to the closure site a little before noon. Now, normally, sitting in traffic waiting for the pilot car can be frustrating, but the views here are 360-degees of stunning. Once the road opens we take it all the way to the end to the Kolob reservoir. We follow the dirt road around the reservoir until it becomes impassable. 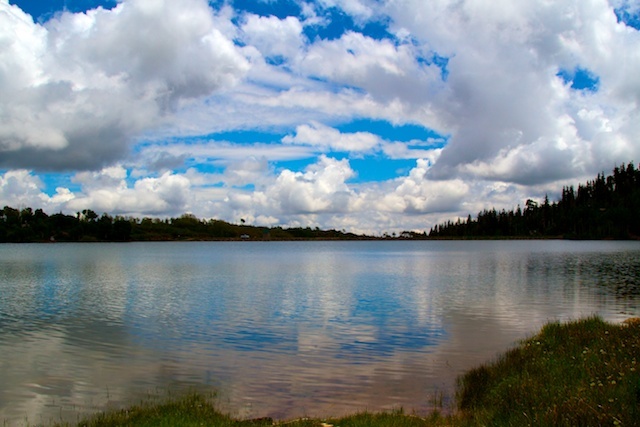 There are a number of disbursed campsites around the lake. It’s a great spot for our picnic lunch. Since the road won’t be open until 4:30, we take our time returning and stop at Lava point for a short hike and some dramatic views. Heading out we take the Zion Mt. Carmel Highway. The road passes through the Zion Mt. Carmel Tunnel. The tunnel was built in the 1920’s and is not large enough to allow two-way traffic for oversized vehicles. From 8:00AM to 8:00PM the park operates one lane traffic control. According to their standards, poor Dimples is 12 inches too wide, so we must pay a $15.00 bounty to pass. Again the scenery is amazing. 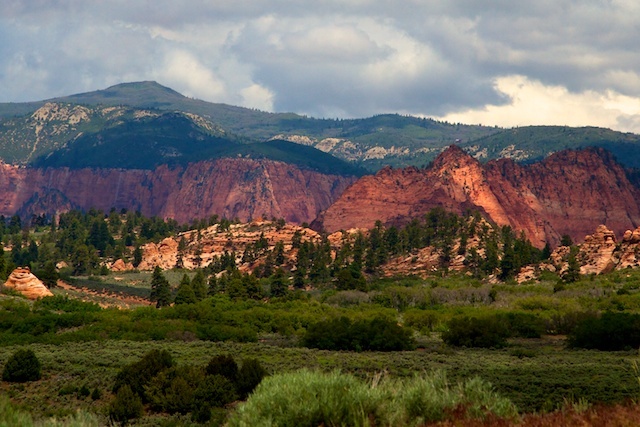 Towering red cliffs against cloudy skies. We even spot a small herd of Bighorn sheep lazing about on the rocks. Before leaving Yuma, we call some friends in Las Vegas. They have a rustic cabin near the West Rim of the Grand Canyon, and invite us to join them. 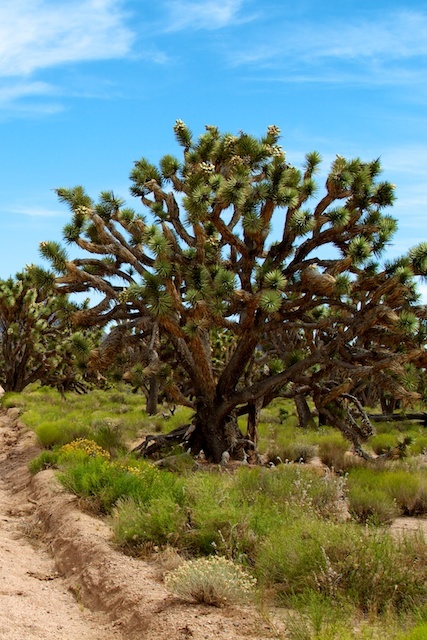 We turn off onto the dirt road that leads up to their place, and are immediately in the Joshua Tree National Forest; Acres of huge Joshua Trees, more impressive than Joshua Tree National Park. A few miles outside of the national forest up we arrive at their place. Our amazing friends have trimmed brush along the road so Dave is spared some Arizona pin striping and cleared a spot for Dimples on the hillside below their cabin. We originally plan to stay only a few days, but our friends convince us to stay longer. We have cell service with data, plenty of power with our solar and generator, and they have a well and we can fill our water tank, but dumping is a problem. Our macerator can pump uphill from our site to their septic, but our hose is ten feet too short. We find an extension hose on-line at camping world. It’s even on sale. But the fastest shipping available is 7-10 days. Our friend devises a solution, 10 feet of PVC pipe gorilla taped to the macerator hose. So with our MacGyver sewer solution we ultimately spend 8 days here, hanging out with our friends and their colorful neighbors, sharing meals, watching sunsets, hiking a bit and drinking a bit (ok A LOT.) Thanks S & B for a great start to this summer! We also venture off the mountain a couple of times. 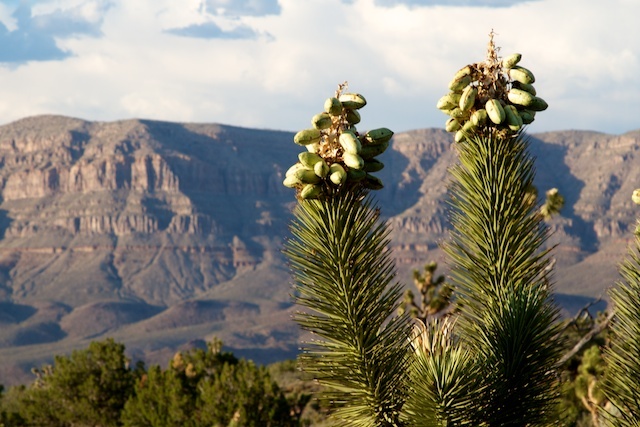 Drive up to the Skywalk at the Hualapai Indian Reservation but opt not to do the walk. ($75 each and no camera’s allowed… too much and no point.) On our way back we stop at the western town. Looks like a movie set decorated in rust and calico. There are a few shops, a restaurant, horseback rides and Native Americans dressed like cowboys posing with Asian tourists brandishing rifles and six shooters. On the road in there was a sign that says, “This Is A Fee Area.” We ask and no one seems to know how much. We’re hungry and head to the restaurant and ask them about the entry fee, they don’t know either. So we order lunch. Since this is the western town it’s BBQ ribs, beans and corn on the cob. When we get back up the mountain, we check out the Skywalk Website. Turns out the protocol here is to buy tickets at the main tent, and take a bus to three sites, including the western town, which is outside the main gate. OOPS! Shouldn’t $33 for a marginal lunch cover the price of admission to one site? As we’re getting ready to leave, we notice that Dimples has a flat tire. The leak is coming from the valve stem. Chris uses our handy dandy portable pump to fill up the tire and we are able to get down the mountain and change the tire in a level shaded spot at a service station along the highway. Turns out that the vibration from the remote tire sensors is wearing on the valve stems. (Probably the cause of our last flat.) Once we get to Overton, we have all of the valve stems replaced with metal ones. Now were ready for the wilds of Southern Utah!